1)YOU DON'T NEED TO KILL THE SNAKE. Once the snake is caught on the glue trap, take it outside, and pour some vegetable oil on the snake - or spray PAM cooking oil, and the snake will wiggle itself free. It's fun to watch. 2)Don't use glueboards outside. They might catch a number of helpless little critters. I consider this inhumane. Only use a glue trap inside, where you can monitor it. (As a sidenote, I do NOT recommend the use of glue traps for rodent control. There's better ways to catch rats/mice, and I think glue traps are very inhumane). 3)Beware your children and pets. They may not get stuck and die on the trap, but these things are really sticky, and it won't be fun pulling it off of old Rover. 4)For best success, set the trap along the edge of a wall in the vicinity that you've seen the snake. Snakes often hide from movement or danger, and only come out when it's quiet and safe. They can hide for a very long time on no food. They can hide in the tiniest of little nooks or crannies. That's why, when I arrive at a home to search for a snake, it's often hard to find. If you've lost sight of it, and you've got a lot of debris in your home - or holes behind the kitchen baseboards or washing machine, etc, then forget it. I probably won't find the snake. Now it's true that I have found them many times - under boxes, under furniture, in shoes, etc. However, I've probably more often set glue traps in the cases in which the customer has lost sight of the snake - "it was here earlier today" I hear the hapless customer say. Alas, it's not here now. 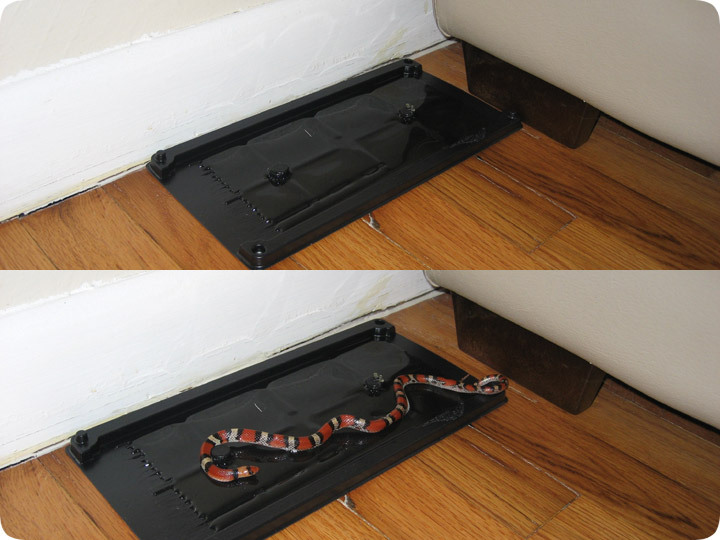 But if I set some glue traps, it may be here later, as seen in the above photo (of a Scarlet Snake, caught in an Orlando home). So there you have it, the only real effective snake trap. Remember, prevention is always the best medicine, so it's best to seal off all of those little gaps in your home that snakes can use to gain entry.